Girls Tennis Practice will begin Wednesday August 1st at the Tennis Courts in Miami Township Park behind the bus garage at 9am. Text @taytennis to 81010 to be signed up to receive updates in case of inclement weather. Also you must be signed up in final forms, have all forms signed and completed by the student and parent and have an active physical on file in the athletic office. 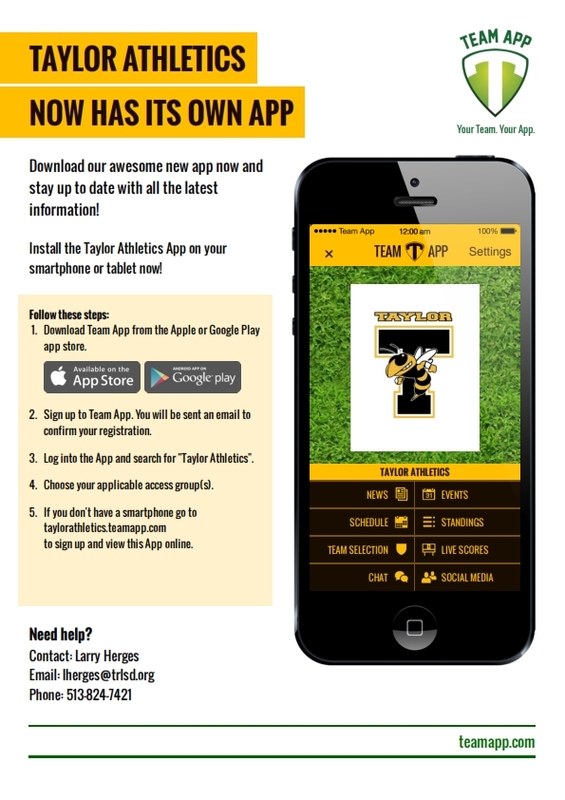 The Taylor Athletic Department has teamed up with GoFan for Yellow Jacket fans to purchase athletic season passes. This year, season passes will be purchased and downloaded onto your smartphone. Fans will show their phone at the gate and our ticket takers will verify your admittance to the game. No more lost passes or forgot to bring it to the game. Just download the app and you have your ticket with you at all times. You will see two options, 1) to purchase individual Football Tickets for home games or 2) Taylor Athletics Mobile Pass. Football single tickets are $7 for adults and $5 for students. (Please note this is new price for Varsity Football Games this year established by the CHL) All other events will stay the same as last year. Buying advance tickets saves you time entering the gate. Please note, Season Passes will only be sold online and paid via a credit card. *There will be a service fee for each Mobile Purchase from GOFAN..
Taylor Athletics has a NEW APP! Get up to date information on your smart phone. Taylor Athletics has introduced the latest and greatest way to get up to date athletic information. The App provides up to date schedules for your favorite Yellow Jackets Team, News, Live updated scores, Pictures and more. Download the APP and be a part of Yellow Jacket Nation!! All student athletes are required to register with Final Forms. Go to FINAL FORMS WEB PAGE to sign up. Need help registering? Go to Final Forms Instructions.